Most people use public libraries to check out books or access other onsite and online resources. A few of us sometimes walk into libraries with much less focused goals in mind, and walk away with unexpected opportunities beyond our wildest dreams. When Licia Wells and I joined a friend at the reopening celebration for the Bernal Heights Branch Library here in San Francisco on January 30, 2010, we had no idea that we were about to become involved in a community-based, volunteer-managed, neighborhood beautification project in an entirely different part of San Francisco. As a former San Francisco Public Library employee and ongoing fan of what libraries offer all of us, I was excited about visiting the newly renovated branch and having a chance to see the branch manager and other colleagues that afternoon. And when Branch Manager Lisa Dunseth—who now is working in the Main Library San Francisco History Center—asked if we wanted to meet Colette Crutcher, an artist who lives in the Bernal Heights neighborhood, none of us could have imagined where our introductions and conversations were about to lead us. 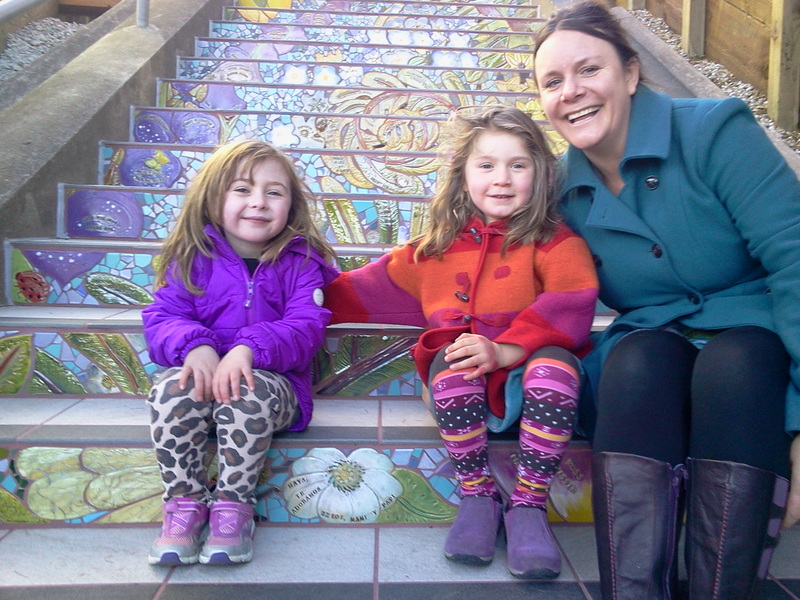 Within a few minutes of meeting Colette, we all realized we had something in common: the Inner Sunset District’s Tiled Steps project connecting 15th and 16th avenues on Moraga Street. Colette and Aileen Barr had designed and overseen installation of that project; Licia and I were among the many admirers of that much-loved neighborhood landmark which attracts visitors from all over the world, so we had one question for Colette: If we could pull together another group of interested neighbors as Alice Xavier and Jessie Audette had done for the Moraga Steps, would she and Aileen be interested in working on a second tiled-steps project near the original site? Colette, as we learned later, had had conversations like that one many times. Nothing had ever come of them. But this was to be a different set of circumstances, starting with a few of us who loved the non-tiled steps near our homes and wondered what we could do to stop the vandalism and deterioration that was making them a less-than-inviting walkway. The thought turned into action a few days later when I saw Liz McLoughlin, who lives at the top of the 16th Avenue steps that connect Kirkham and Lawton streets. Liz and her husband Tom had spent countless hours sweeping debris from the steps and painting over graffiti which continually reappeared on a large wall near the top of the walkway. She immediately expressed interest in and enthusiasm for the idea of trying to form an organizing committee that could bring the project to fruition while creating a stronger sense of community within the Inner Sunset District. With little more than a vague awareness of how Alice and Jessie had ceaselessly worked to lead the Moraga Steps project to fruition—and with a lot of information generously and graciously provided by Alice in the early stages of our discussions—Liz and I agreed to serve as co-chairs for a new organizing committee, Licia agreed to help oversee the effort to raise the $300,000 we eventually determined we would need to bring the effort to completion, and Colette and Aileen started working on designs for what became the Hidden Garden Steps. The year-long process of creating the infrastructure to make the project work is a story for another day. What remains to be done here is to draw a line from that initial conversation at the Bernal Heights Branch Library right back to the San Francisco Public Library system’s continuing role as a community resource that helps foster the creation and growth of communities and community efforts. When we officially began our fundraising and marketing efforts early in 2011, I visited with a colleague at the Sunset Branch Library—a few blocks away from the proposed site for the Hidden Garden Steps installation—to see whether a public presentation by the artists would be of interest to the library’s community of users. A few hours later, a second colleague—Robert Crabill, who was unaware of that initial conversation but had just come across an online description of the project—contacted me about the possibility of having the artists do exactly what I had proposed. And the event, held earlier this week, drew 30 people into the library’s small community meeting room to hear about both tiled-steps projects from the artists; see sample tiles; and learn how they could become engaged in our efforts if they wanted to be part of what we are well on the way to accomplishing. We have received other requests for similar presentations, are planning more events, and are delighted that new volunteers are joining the effort to continue what Alice, Jessie, Aileen, and Colette started. 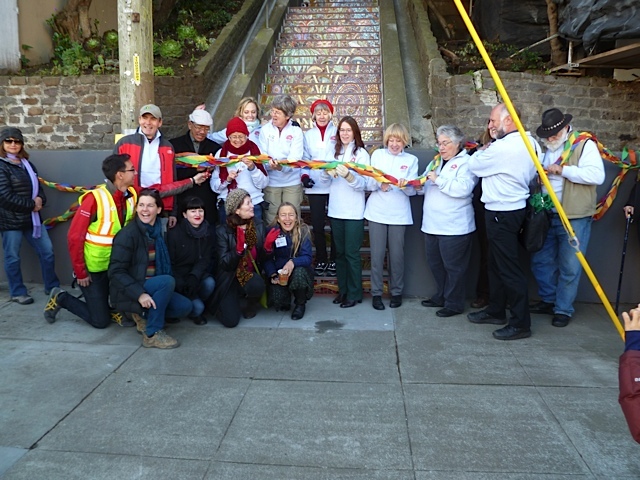 And those of us who are continuing to work on the Hidden Garden Steps and add to the existing sense of community that exists here in the Inner Sunset District couldn’t be happier than to have such wonderful informal and formal partners. N.B. 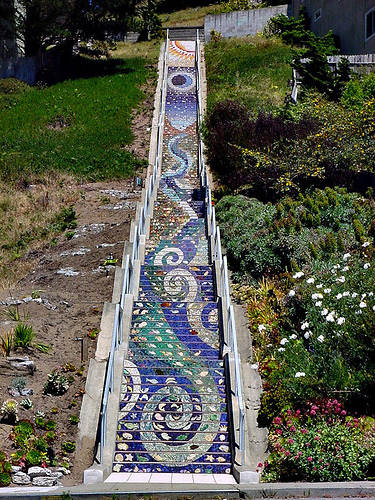 : This is the third in an ongoing series to document the Hidden Garden Steps project in San Francisco. A dream achieved has taken on new life. 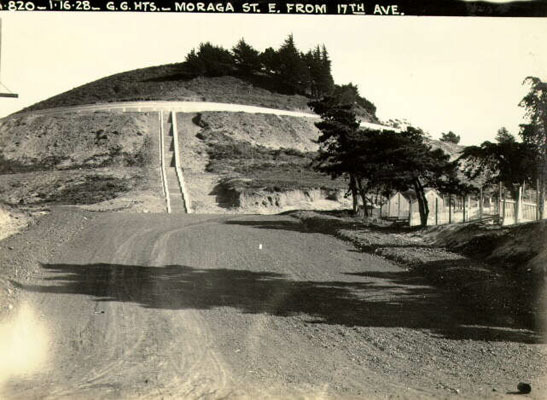 Several years ago, Alice Xavier and Jessie Audette in the Golden Gate Heights neighborhood of San Francisco’s Inner Sunset District, dreamed of turning a drab gray set of 163 steps connecting Moraga Street between 15th and 16th avenues into a beautiful ceramic tiled community meeting place. They teamed up with local artists Colette Crutcher and Aileen Barr—“local” being a relative term since Aileen arrived in San Francisco from Donegal, Ireland shortly before the project began and is there on vacation as I write these words—and literally had to build from scratch—a process colorfully documented in the artists’ book, 163: The Story of San Francisco’s 16th Avenue Tiled Steps. They also created an incredible group of neighborhood supporters to bring this innovative community-building project to completion. 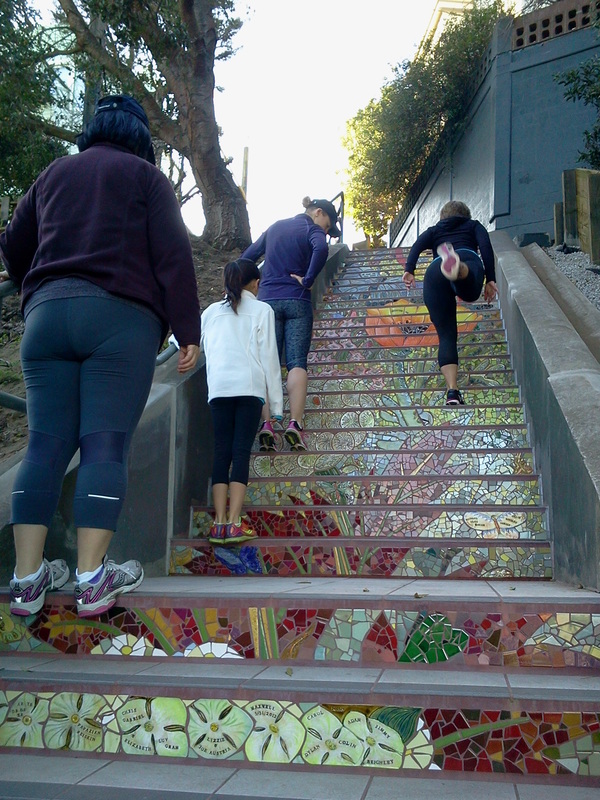 Inspired by the Santa Teresa steps in Rio de Janeiro as well as Antoni Gaudí’s mosaics in Barcelona and La Scala (the stairway) in Caltagirone, they literally fought an uphill battle in their efforts to create a work of beauty that now entices walkers to climb the stairs for a stunning view of the Sunset District as it extends west to the Pacific Ocean—on those days when the view isn’t obscured by fog. They had to gain political support for the project, convince neighbors that their project was well worth undertaking, attract donors and volunteers—something at which Xavier clearly excels—and organize and orchestrate fundraising events, planning meetings, and in-kind donations to support the project in those years just before Web 2.0 social networking tools like Facebook, Twitter, and LinkedIn grew to make it far easier to reach and/or develop communities of interest. 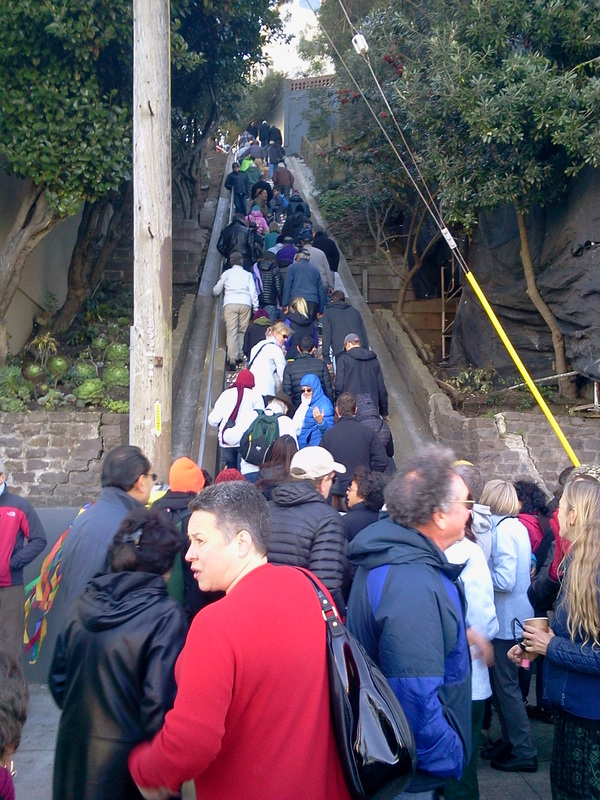 When the innovative project was complete, many of us who had watched the stairs become a community meeting place were stunned, inspired, and motivated to see this as a beginning, not an end. 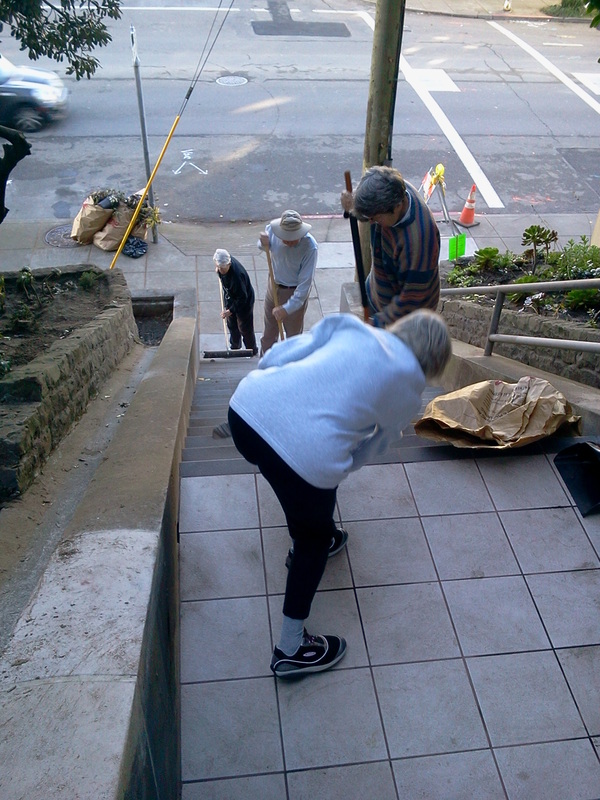 Furthermore, because the Inner Sunset District has numerous concrete stairways linking streets along the hills and waiting for similar treatment, it’s natural for many of us who live and thrive in the neighborhood to think about how wonderful it would be to build upon what Audette, Barr, Crutcher, Xavier, and all their supporters and volunteers have created. So it’s no surprise that during a party at the foot of the Moraga Steps less than two weeks ago to commemorate the fifth anniversary of the completion of that project, a group of us were on hand to announce the official beginning of a new project: the Hidden Garden Steps, to tile the dank, overgrown, and graffiti-laden steps linking 16th Avenue between Kirkham and Lawton streets, create a community garden on either side of the steps, and provide a complementary wall mural at the top of the steps. N.B. 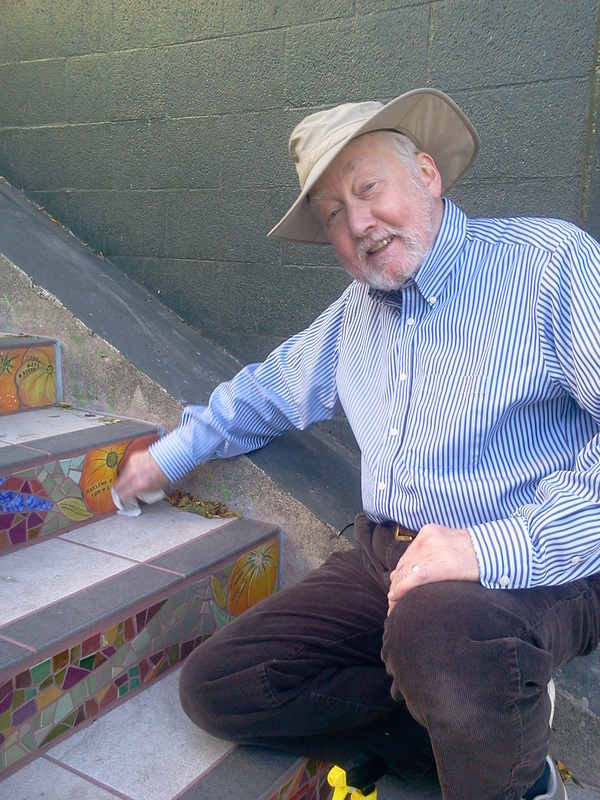 : This is the first in an ongoing series to document the Hidden Garden Steps project in San Francisco. Next: Building a Community of Support.